Scanning by laser, contact or imaging techniques requires an extended scan body, clear rotational features and a surface that is scannable without applying any powder or colouring. The connection to the mating part, i.e. implant, requires high quality machining and precision. Neoss® Scan Bodies are designed and manufactured to ensure high and consistent accuracy of the digital impression. Scan bodies are available for the Neoss Implant System and for a range of non-Neoss implant systems. Each scan body is marked with a dedicated platform number for ease of selection, i.e. 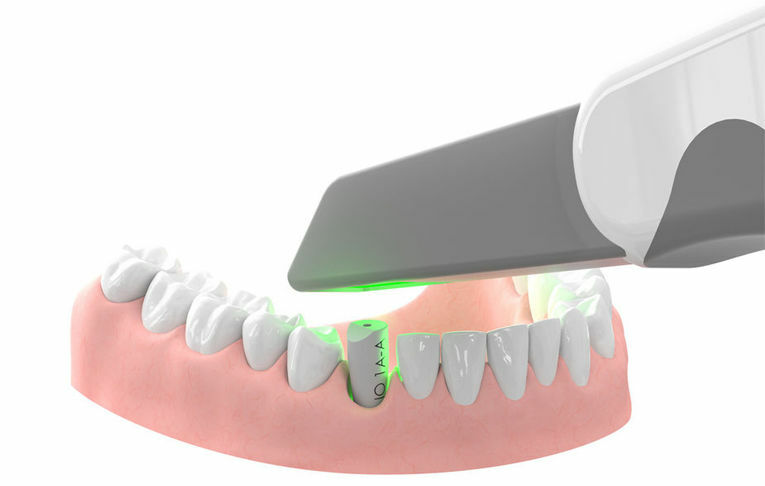 Neoss Intra-Oral Scan Body Ø3.5 – Ø6.0has platform number I O 1A-A. The same Neoss Scan Body screwdriver is used for all scan bodies regardless of platform. Scan bodies are compatible with most available scanners and planning and design software including 3shape, Exocad and Dental Wings. Simply download the appropriate Neoss Library available from Neoss. Neoss Intra-Oral Scan Bodies (marked I O 1A-A) are placed directly on implants or abutments in the patients’ mouth and are intended as a means to perform a digital impression using an intra oral scanner. Alternatively these can be placed on an implant replica in a model and a digital impression can be recorded using a desktop 3D scanner. The purpose of a digital impression is to accurately transfer the position of the implant, or sometimes an abutment, in relation to natural teeth, other implants and soft tissue contours to a digital laboratory model in preparation for design work of a restorative solution using different design software. Note: For digital impressions of more than one implant, each implant/abutment requires a scan body during the scanning. In addition for larger cases only desktop scanners or dedicated scan centers are recommended to achieve the appropriate accuracy of the digital impression. The Neoss scan bodies are only to be used with the original Neoss Scan body screw driver and original Neoss digital libraries. Peek (natural white) with a titanium base and screw. Scan bodies and related screwdriver are available as individual items.